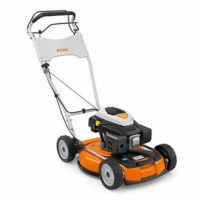 The RM 4 RTP is a self propelled professional mulching mower, designed with power and endurance in mind. The machine includes several features which make it the natural choice for professionals such as central height adjustment, front and rear carrying handles and ergonomic controls. To make this a robust machine and well suited to the pro market, it features a powerful easy start engine, cast aluminium deck, large rubber wheels with aluminium rims, crankshaft protection, front and side deck protection and a protective gearbox cover. Primary areas of use include parks, orchards and roadside verges. Low vibration figures make it the ideal machine for use by professionals. The RM 4 RTP comes with a 1 year professional warranty or 5 year extended domestic warranty (subject to registration and annual servicing).